Living Revision came to me at just the wrong time for writing a thoughtful, considered and timely book review. It came to me at just the right time for companion wisdom as I began to traverse an actual revision of life. I read, reviewed, and loved Elizabeth Jarrett Andrew’s novel, Hannah, Delivered, and I am an avid reader of books about writing and the creative process that speak as much to craft as they do to the human condition. This includes authors like Heather Sellers, Anne Lamott, Julia Cameron, Elizabeth Gilbert, and Georgia Heard. So I thought I’d be engaging Living Revision as one of these what I like to call “writing devotionals.” I always have a list of ongoing and upcoming writing projects and regularly engage this kind of work. “But such a draft seems immutable and leaves the writer powerless. The more we write, the more we understand how malleable these things are.” (p.72). Or even just take the list of “toolboxes” throughout the book where Andrew gets practical about the art and craft of revision and read them as being about living as much as they are about writing. These include things like “Questions” and “Listening to the Details” and “Writing While Overwhelmed.” That last one, translated by me as “Living While Overwhelmed,” is the best descriptor I can come up with for what this has been like so far. Andrew notes that “disorder is the necessary precursor to unity” and any writer knows how true that is of the drafting process. Today, my physical and mental self knows how true that is of transitions in the middle of life itself. What if we thought of our lives as drafts always in progress? What if we thought of our writing projects as lives still being lived? I suspect that these are precisely the kinds of swaps that Andrew had in mind when she subtitled the book “A Writer’s Craft as Spiritual Practice.” For at least the past six months I have been deeply immersed in the process that Elizabeth Jarrett Andrew is speaking to in Living Revision: seeing anew, reframing, reconsidering, shifting, mapping, taking apart and putting back together, seeking careful feedback, letting it all rest. Returning to her words in small bits along the way during this process has been a gift. Sleeping (more and less) with manuscripts under the bed and whirling life-changes in my head is indeed Living Revision. Life being revised, while manuscripts still breathe. 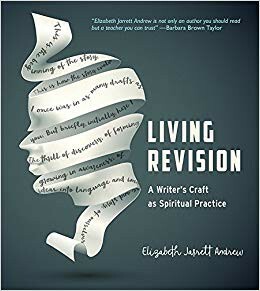 For those of us who write, whether we publish or not, Elizabeth Jarrett Andrew’s Living Revision is fine companion wisdom along the way.